William Shatner may have saved the galaxy countless timeswith the Starship Enterprise on TV's "Star Trek," but can he commandhis native land of Canada? Some die-hard fans think so ? they want the originalCapt. James T. Kirk to lead Canada as Governor General. The Shatner believers have launched a Facebook campaigncalling for Shatner, a native of Montreal, to be appointed to a real five-yearmission as the ceremonial Governor General of Canada. As of Wednesday,nearly 41,000 people were supporting the bid. "It's time for Canada to boldly go where no countryhas gone before," the fans wrote on their Facebook post. "It's timefor Canada to appoint the incomparable William Shatner to the position ofGovernor General. Indeed it's time to Back the Shat." But will Shatner, 79, take charge if he wins theappointment? The famed actor from "Star Trek"and other television and film roles mentioned the Canadian call for hisleadership with humor on his Twitter page, where he posts updates under thename "WilliamShatner." "I believe GovernorGeneral means you govern the generals. Does that make me part of thearmy?" Shatner wrote. Actually, Canada's GovernorGeneral serves as the Commander-in-Chief of the country and acts on recommendationsfrom the prime minister to appoint the chief of Canada's Defense Staff andRoyal Colonels, according to a Canadian government description. The governor represents thecountry during state visits abroad, is responsible for receiving royal visitors,heads of state and foreign ambassadors at Rideau Hall in the Citadel of Quebec,creates new coats of arms for Canadian citizens and corporations, and presentsawards and honors during ceremonies to recognize valor, excellence, bravery andother achievements, according to the description. Among his myriad other roleson the stage, television and screen, Shatner portrayed Capt. James T. Kirk inthe "StarTrek" sci-fi TV franchise from 1966 to 1969,and reprised the role in seven feature films in the 1980s and '90s. He haspenned numerous science fiction and autobiographical novels, directed films andappeared in many other television shows as both actor and host. Canada's Governor General is a largely ceremonialposition currently held by television broadcast journalist Micha?lle Jean. Shewas appointed in 2005. Whether or not Shatnerbecomes Canada's next Governor General, he has other things cooking here in theUnited States. On May 1, he'll host theWilliam Shatner 20th Annual Hollywood Charity Horse Show to raise funds forvarious charities for children. 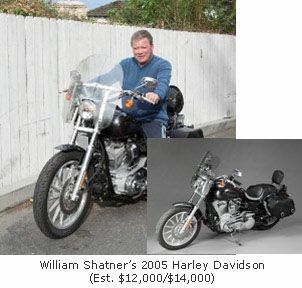 Later this summer, Shatnerplans to auction off his Harley Davidson motorcycle and other personal items aspart of a larger Trek-themedcharity auction in Las Vegas in June.